It’s that time of year again! Time for turkey, mashed potatoes, pecan pie and Christmas cookies. Basically, time to buy a new (larger) pair of pants. 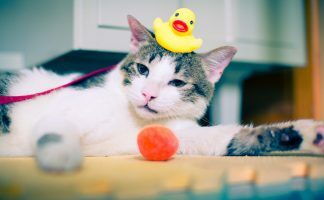 While we humans are sitting around the dining table devouring delicious dishes made from decades-old recipe cards, our pets are typically eating whatever we always feed them: Some wet cat food, maybe some kibble, or a few dried treats. If your cat is anything like Pumpkin, he’s sitting at your feet while you prepare the holiday ham whining for a bite. 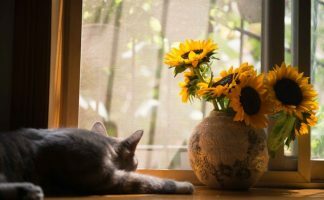 And that might make you wonder: Should I give my cat human food? What’s safe for him to have a nibble of, and what’s not? 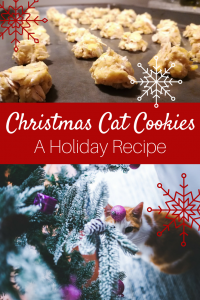 Believe it or not, there are actually many human foods that cats can enjoy any time of year. 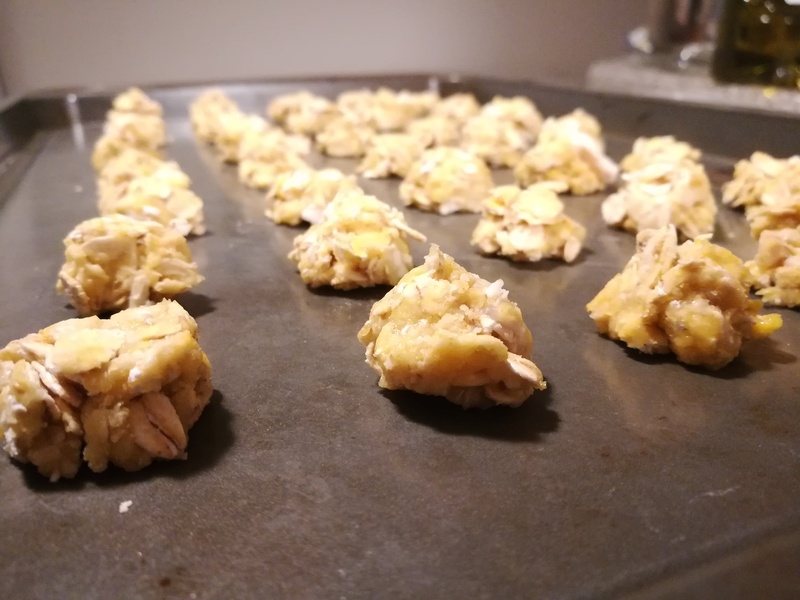 That being said, you shouldn’t increase your cat’s overall caloric intake by much, so remember: “All things in moderation.” Just give your cat a nibble — not your entire plate — and spoil your cat with these yummy human foods. Meat: I mean, your cat is a carnivore, after all. Don’t feel guilty passing her a piece of ham or turkey under the table. Just be wary of raw meats, since those could make your cat sick. Fish: Again, this might not surprise you. If your holiday dinner typically includes a fishy dish, sneak a piece or two to Whiskers and he’ll thank you later. Eggs: These need to be cooked — alone, or in something — just like the meat and fish. As is the case with humans, eggs are a protein-packed snack. 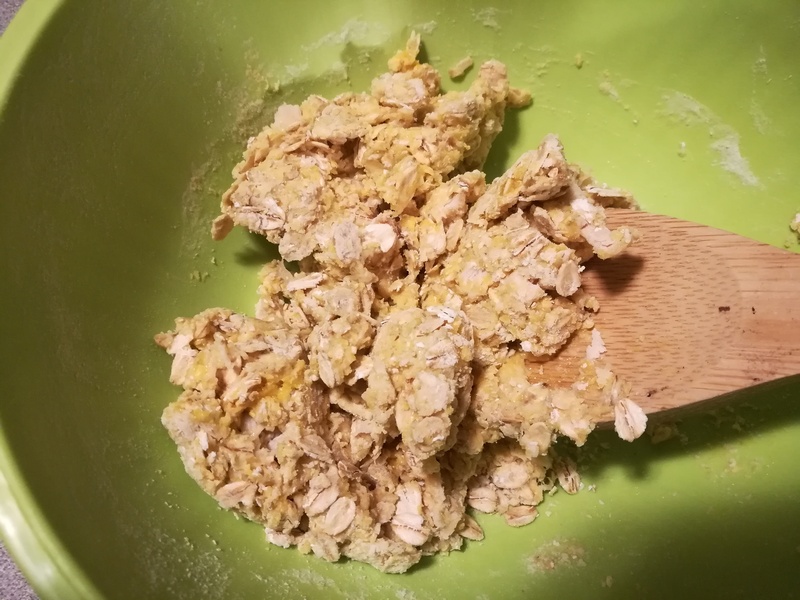 Oats and couscous (and other whole grains): You’ll want to cook them first, but grains can be a great part of your cat’s holiday diet. Pumpkin insists on trying to eat muffins, which I let him do from time to time. 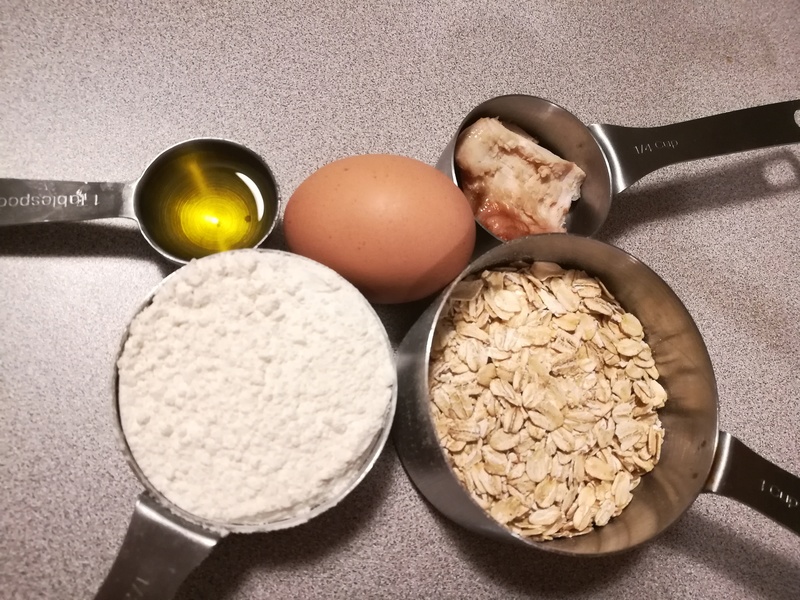 Looking for ideas on how to serve whole grains in a healthier fashion? 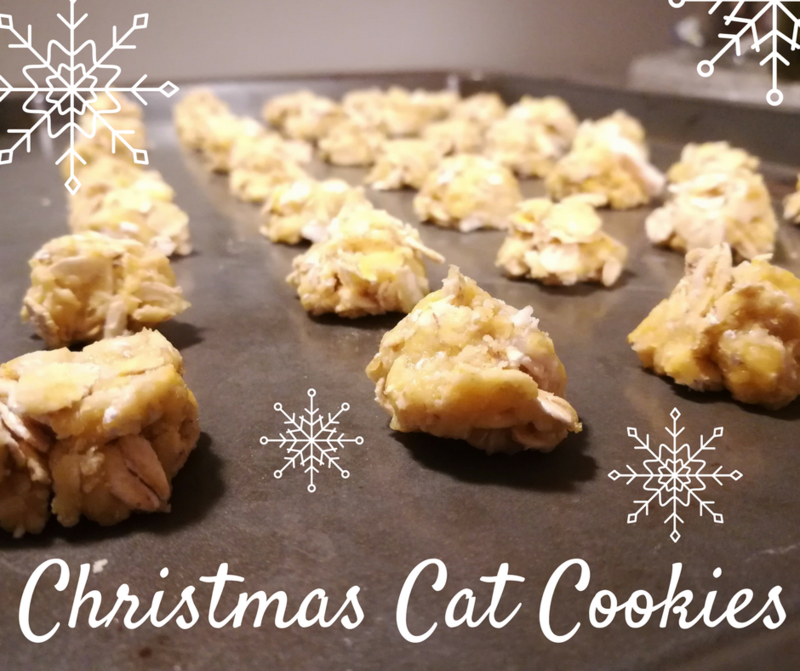 Check out the recipe at the end of the post for cat cookies made with oats. Veggies: Yes, humans might not consider vegetables a treat, but your cat might enjoy a bite of steamed broccoli. If you aren’t keen on sharing your slice of roast duck, try slipping your cat a brussel sprout instead. Cheese: In moderation, of course. Not all cats digest dairy well, so you might want to skip this altogether. That being said, you could add it in a baked treat or give your kitty a nibble and watch her reaction over a few days. Alcohol, onions and chocolate, on the other hand, are NOT good for your cat. So keep the spiked eggnog and Santa’s chocolate chip cookies all to yourself. 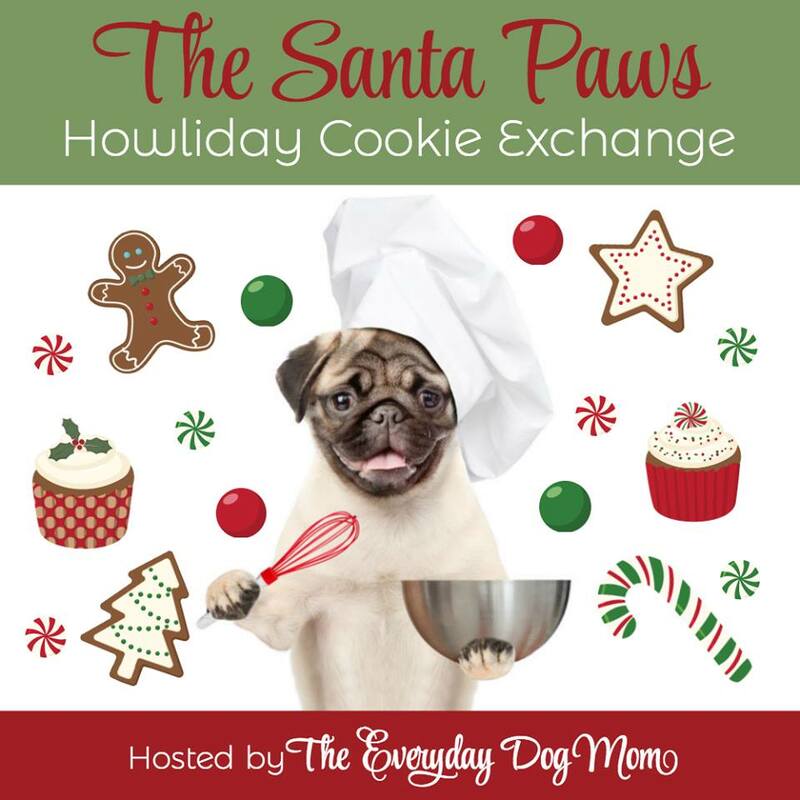 If you’re in the mood for sharing AND spoiling your cat, however, here’s our recipe for Christmas Kitty Cookies, and below you’ll find links to tons of other recipes as part of the The Santa Paws Holiday Cookie Exchange! 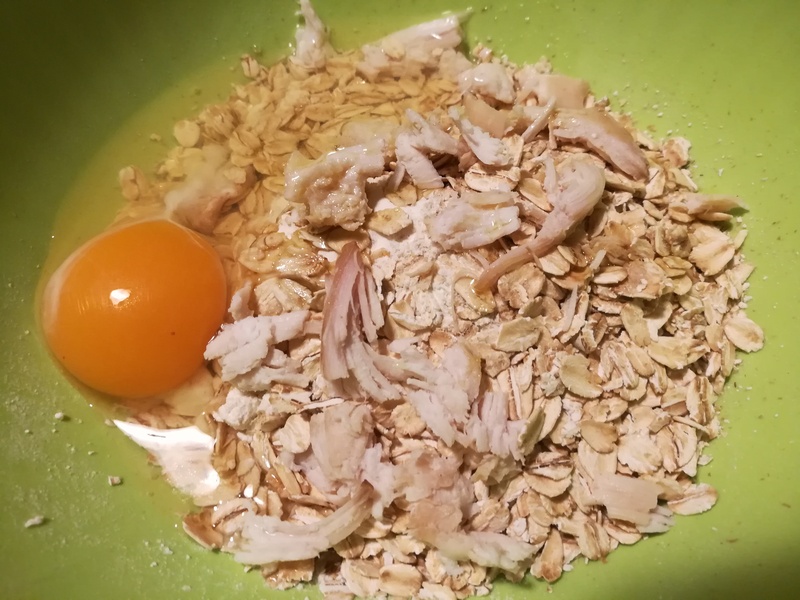 Empty ingredients into a mixing bowl. Combine with a spatula or spoon until you get a thick paste-like consistency. (In retrospect, I recommend whisking the egg before combining for ease, but it’s not necessary). Shape into cat-sized cookies. 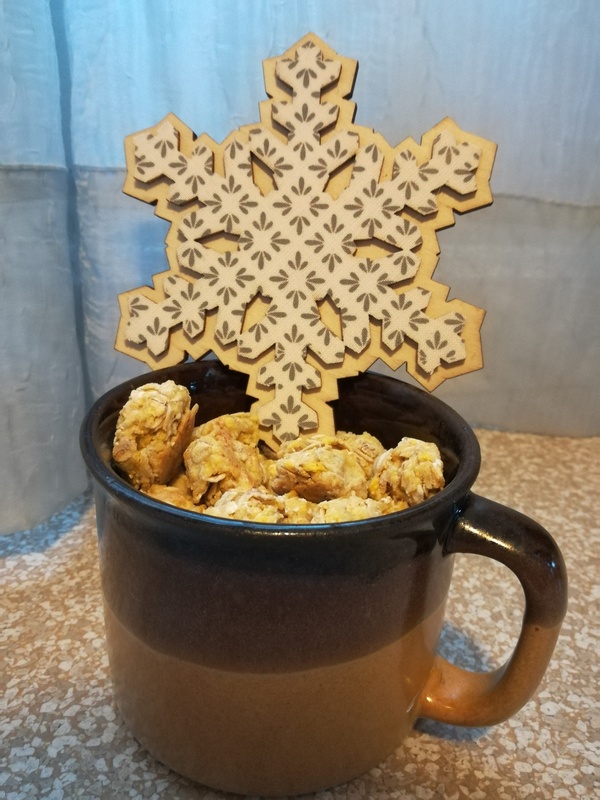 You could use a mold or cookie cutter, but I just made small circles. 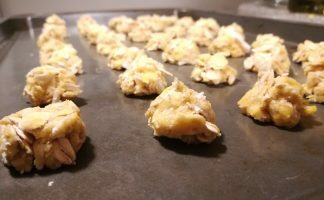 Cook for 7-10 minutes, until the cookies are slightly brown and firm to the touch. Let cool, and serve! Store in an airtight container for up to one week. DISCLAIMER: All content and material provided within Leaping Cats is designed for educational, informational, and entertainment purposes only. The information provided on this web site is not intended to be used to diagnose, treat, cure, or prevent any disease or condition in any animal, including humans. In no way is any of the content on this web site to be construed as medical or veterinary advice, consultation, or instruction.